The call for free papers and symposia is now closed for the 2018 AOPA National Assembly. We look forward to your future participation. For those who have submitted papers for the 2018 AOPA National Assembly—thank you for your interest and agreeing to share your expertise with attendees in Vancouver. We are currently in the process of finalizing grading and sending notifications. We appreciate your patience during this process. August 15, 2018 or before – Secure hotel reservations as they will likely sell out. AOPA is asking all presenters to sign a presentation waiver form as AOPA will be recording presentations this year. Your presentation will be available to AOPA members for future use. Visit AOPAversity to preview how the recordings are made available. If you submitted a free paper, you are not required to sign a form because this was completed through your online submission process. Presenters are encouraged to utilize the Congress PowerPoint template. Using your own PowerPoint design template is permissible, however, the planning committee respectfully asks that all presenters limit the use of their corporate logo on their handouts and presentation slides to the first and/or last slide only. AOPA will be happy to copy and distribute your handouts. 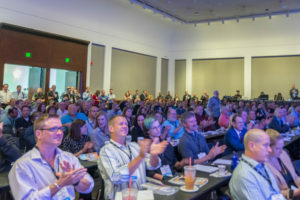 If you have a presentation handout, please email to rgleeson@aopanet.org by August 30, 2019. Handouts will be distributed via the mobile app as well as printed. You are also welcome to copy and bring your own handouts. AOPA will not have access to equipment to make copies onsite. A multiple choice quiz is required and necessary to allow attendees the opportunity to earn extra CE credits for participating in your presentation. 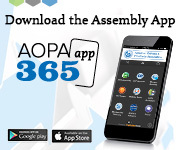 The quiz may be accessible to attendees during your session on the AOPA365 mobile app. Please email your quiz to Ryan Gleeson at rgleeson@aopanet.org by August 15, 2019. If you are submitting a free paper please provide 3 questions. All other programming, requires 10 questions. All meeting rooms will be equipped with a full complement of audio visual equipment, including projector, computer, and microphones. Should you have special needs, please contact Ryan Gleeson at rgleeson@aopanet.org. All presenters should plan to check in with the AV technician assigned to your meeting room at least 30 minutes before your program is scheduled to begin. Each presenter will receive a link and code to register online. Please be sure to complete the online registration form to confirm your participation and secure your badge for the show. All participants need a badge to access the exhibit hall show floor and to access education meeting space. Students and residents are encouraged to submit their poster presentations, and are entered to one one of two prestigious awards. Deadline is July 20, 2019. Promote your session across your personal social media channels. Specifications and guidelines for your presentation available online. For travel and hotel information please refer to the Location and Travel page.